After an earthquake, hurricane, tornado or other natural hazard, it's considered a win if no one gets hurt and buildings stay standing. But an even bigger victory is possible: keeping those structures operational. This outcome could become more likely with improved standards and codes for the construction of residential and commercial buildings, according to a new report recently delivered to the U.S. Congress by the National Institute of Standards and Technology (NIST). "Current standards and codes focus on preserving lives by reducing the likelihood of significant building damage or structural collapse from hazards," said Steven McCabe, director of the NIST-led, multiagency National Earthquake Hazards Reduction Program (NEHRP) and one of the authors of the new publication. "But they generally don't address the additional need to preserve quality of life by keeping buildings habitable and functioning as normally as possible, what we call 'immediate occupancy.' The goal of our report is to put the nation on track to achieve this performance outcome." The impact of a natural hazard on a community is usually most evident in the lives lost and physical destruction, but the accompanying economic shock, social disruptions and reduced quality of life can often be devastating as well. "Cities and towns can be rebuilt, but lifestyles are damaged, sometimes permanently, if businesses, schools, utilities, transportation and other essential operations are out of service for an extended period," said Therese McAllister, manager of NIST's Community Resilience Program and another report author. The infamous 1906 San Francisco earthquake provides a dramatic example of that impact. In the half-century following the 1840s Gold Rush in California, San Francisco was the fastest growing metropolitan area in the region. 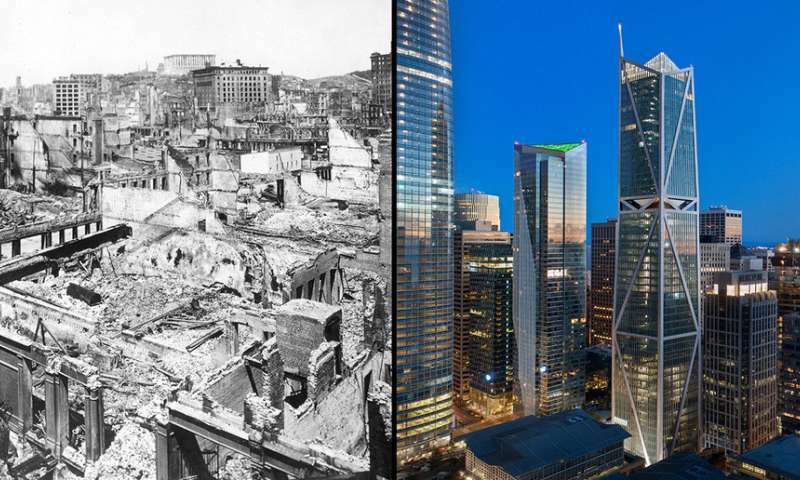 That all changed on April 18, 1906, when the quake and resulting fires destroyed 80 percent of the city, killed some 3,000 residents and left nearly 300,000 people—three-fourths of the population—homeless, out of work and without essential services. Though San Francisco would rebuild quickly, the disaster diverted trade, industry and people south to Los Angeles, which then supplanted the "City by the Bay" as the largest, most important urban center in the western United States. Even with modern building codes and standards in place, there is still room for improvement, as evidenced by the massive damage from the May 2011 tornado in Joplin, Missouri, and the three major 2017 hurricanes striking Texas, Florida and Puerto Rico. "Immediate occupancy performance measures would help avoid catastrophes because they could build up a community's resiliency against natural hazards so that people still can live at home, still can go to work and still can have the supporting infrastructure providing them services such as water and electricity," McCabe said. In 2017, Congress tasked NIST to define what it would take to achieve immediate occupancy performance codes and standards for all buildings in all types of natural hazards, specifically in terms of fundamental research needs, possible technological applications based on that research and key strategies that could be used to implement any resulting regulations. The result of that effort is the new NIST report, Research Needs to Support Immediate Occupancy Building Performance Objective Following Natural Hazard Events (NIST Special Publication 1224). The publication identifies a large portfolio of research and implementation activities that target enhanced performance objectives for residential and commercial buildings. "The report provides valuable information about steps that could be taken to achieve immediate occupancy in the future," McAllister said. The potential research activities presented in the report to Congress were developed with the assistance of a steering committee of recognized experts and stakeholder input obtained during a national workshop hosted by NIST in January 2018. The workshop participants identified four key areas that they believe must be considered when developing plans to achieve immediate occupancy performance: building design, community needs, economic and social impacts, and fostering acceptance and use of new practices. For example, the report states that immediate occupancy performance measures must be developed, established and implemented with a sensitivity to how they will economically affect building owners, business operators, occupants and even whole communities. "You have to make sure that the cost of keeping buildings functional after natural hazards remains reasonable enough that everyone will be able to afford them," McCabe said. The report also discusses key challenges facing the effort to make buildings functional in the wake of natural hazards, such as motivating communities to make the investment, managing how costs and benefits are balanced, and garnering public support. Finally, the report concludes by recognizing that "increasing the performance goals for buildings would not be easily achieved, but the advantages may be substantial" and that making such objectives a reality "would entail a significant shift in practice for development, construction and maintenance or retrofit of buildings." The report, its authors state, is the first step toward creating an action plan to achieve immediate occupancy across the nation with coordinated and detailed research goals and implementation activities. "Our report outlines the steps that could be taken for a big raise of the bar—perhaps the biggest change in building standards and codes in 50 years—but one we believe is possible," McCabe said.